Dimensions 0.75 by 5.50 by 8.50 in. Buddhist wisdom for finding freedom and insight through spiritual practice in the midst of illness and pain. "Let your illness be your spiritual teacher!" Make a statement like that to someone who's struggled for years with, say, rheumatoid arthritis, and be prepared for an eyeroll (at best). To Peter Fernando's credit, he makes that statement, and no such impulse arises. We believe him because he's been there himself and because he backs up the statements with his own real experiences and with real wisdom from the Buddhist teachings. Peter starts by defusing the pernicious belief that anyone is somehow responsible for their illness: You're not "wrong" for being sick. Then, having gotten past self-blame, one can begin to learn self-kindness. From there, one moves to mindfulness practices and cultivating body awareness--even if body awareness is distasteful when the body isn't behaving the way you like. Further topics include getting intimate with dark emotions (fear, despair, the scary future, frustration, grief, etc. ), learning equanimity (rejoicing in the good fortune of those who don't share your suffering), cultivating healthy relationships in the midst of everything, and practical advice for living with pain. Each chapter comes with one or more practices or guided meditations for putting the teachings into practice. 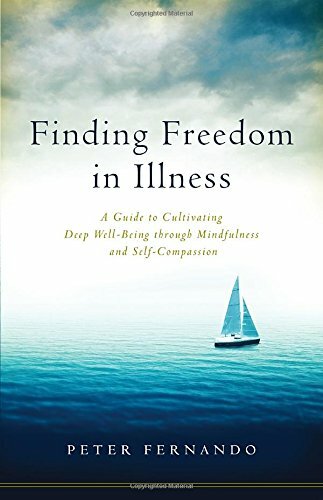 About: Buddhist wisdom for finding freedom and insight through spiritual practice in the midst of illness and pain.